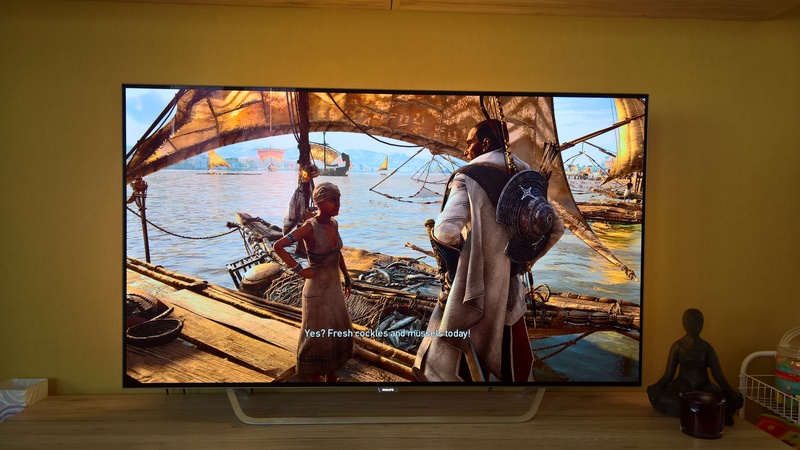 The latest entry in the Assassin’s Creed series is without a doubt also the most ambitious. 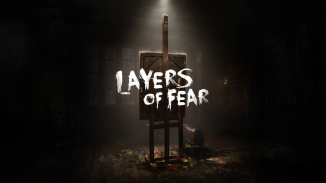 While it’s become something of a running gag that there is a new AC game every year, they took an extra year of development this time around to reinvent the formula and to try and prevent the usual bugs. Did Ubisoft succeed? With Ashraif Ismael as the director (famous for his work on Assassin’s Creed IV: Black Flag) we just might have another gem on our hands. 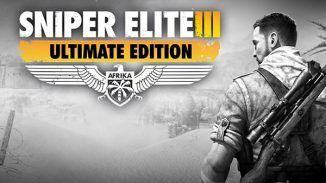 Warning: As this game is HUGE, so is my review! I’ll try to cover almost every aspect of it, so you have been warned! If you don’t feel like reading all of it (but you’d be missing out)… then here’s a useful button to Skip to the End. As is common with the series the story is a somewhat interwoven mix of different elements. 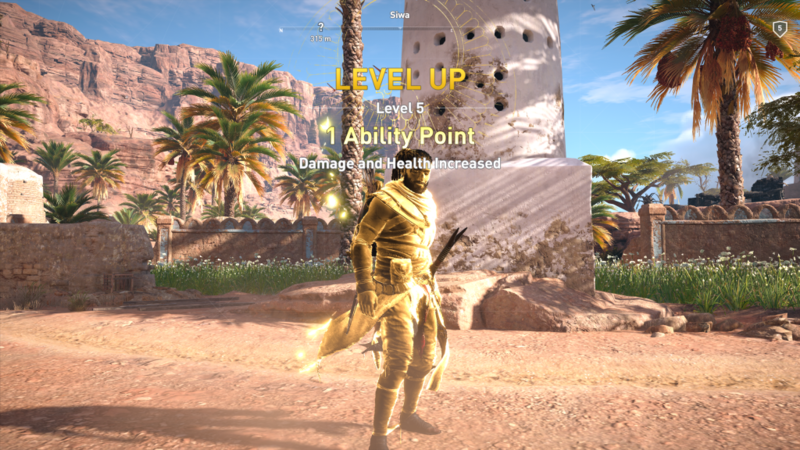 You always have the main driving element that motivates the protagonist Assassin, in this case that’s Bayek, the Medjay of Siwa (something like an official protector), who’s son was murdered and he and his wife seek revenge on his killer. 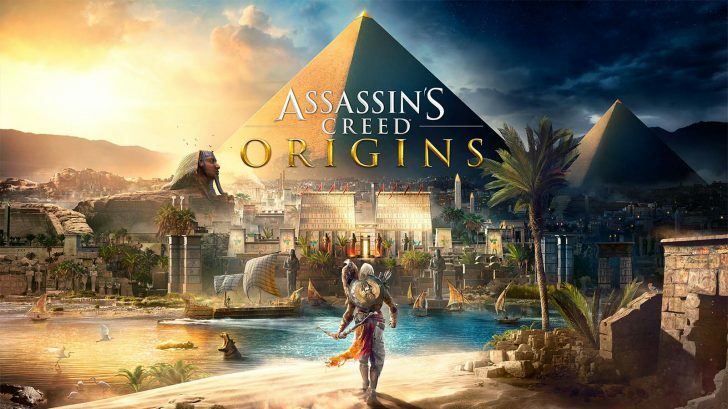 At the same time you have the overarching Assassins vs Templars plot that is present in each instalment but which finds its very roots in this game (as Bayek starts the Brotherhood of Assassins, hence: Origins). And lastly you have the real-world protagonist who dives into the Animus (if you’re unfamiliar with the concept, think of it like the Matrix) to relive the memories of their ancestors. In the present time, you control Layla Hassan, a former Abstergo employee who has made her own portable version of the Animus. What’s special about it is that it doesn’t even require the user to possess any familial ties to the person who’s memories they are reliving. 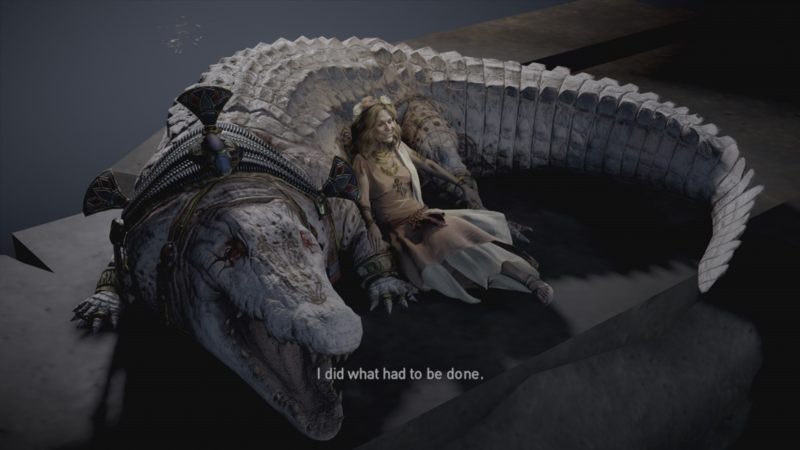 When she found the mummies of Bayek and his wife Aya, she used a sample of their blood so she could prove her worth to the Animus poject. Turned out it was a Jehovah’s witness. Bayek and Aya’s story takes place in Ptolemaic Egypt, right at the time when Cleopatra was dethroned by her brother Ptolemy XIII. 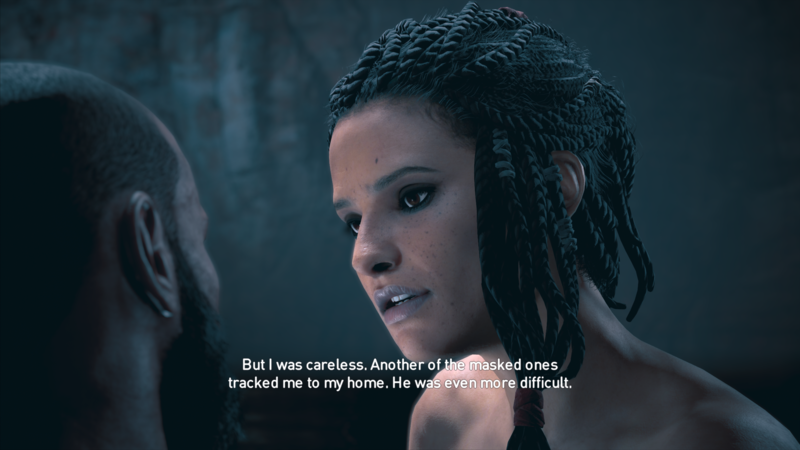 While the historic parts are largely based on real history (or at least what we remember of it as historians sometimes disagree) Assassin’s Creed takes a lot of liberties to mix in its own subplot. 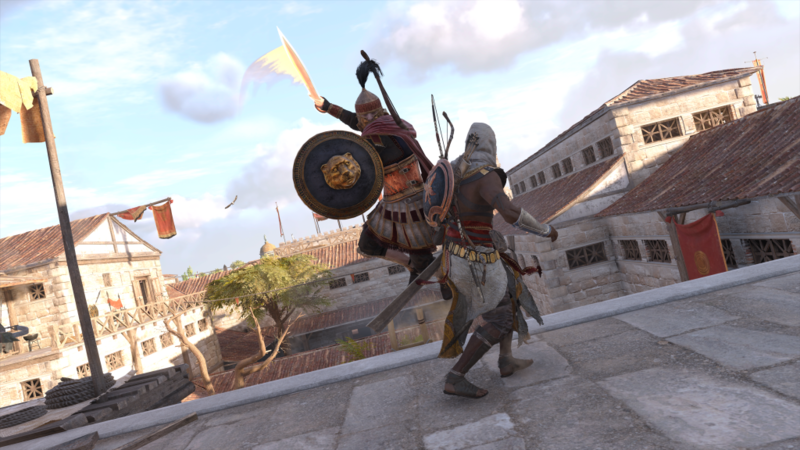 The Order (not yet referred to as templars) is on the lookout for ancient artifacts and during one of their investigations, Bayek’s son Khemu was killed. 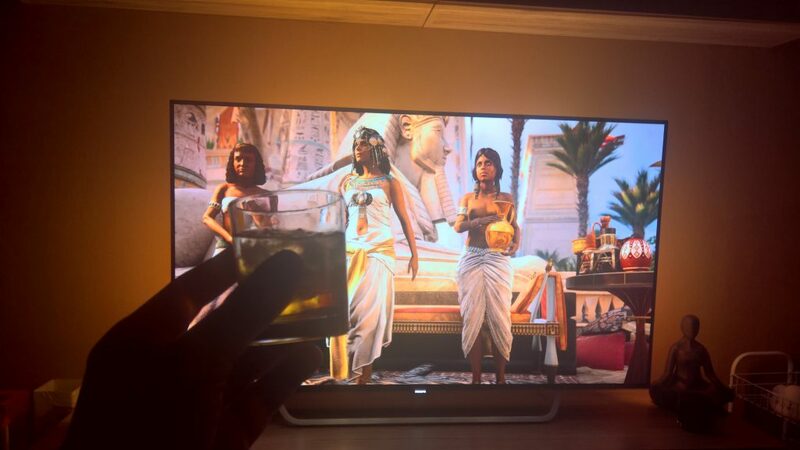 Bayek and Aya swear to track down the killers and at the same time help Cleopatra retake her throne alongside Julius Ceasar, as their goals (and assassination targets) coincide. Cleo even annoints you to be Medjay to all of Egypt, which basically entitles everyone to start giving you even more sidequests. But mostly you’ll be hunting down the members of the order who where involved with your son’s murder. What’s really interesting about these, is that each person you kill has a short scene in the Duat, the Egyptian afterlife. Some of them will convince you they had nothing to do with Khemut’s death, while other more zealous characters will remain convinced they were righteous all along. Painting your crocodile white *had* to be done? Luckily the game isn’t called Savior’s Creed, so you know all of the bad folks are not long for this world. It’s one of the better AC stories told so far and it was truly interesting to see the Origins of the series. The subtle references like Aya picking up an eagle skull Bayek dropped on the beach and seeing the Assassin’s Creed logo left as an impression in the sand: awesome stuff! The game looks stunning! 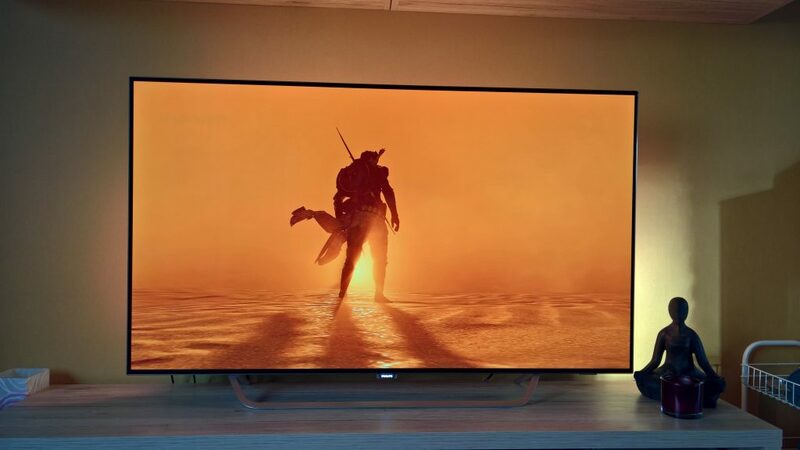 I was already well aware ahead of time that this would be a looker, but seeing it run on my own 4K TV and Xbox One X dropped my jaw on the floor. There are truly some wonderful sights to behold and clever uses of color palettes making it look like you’re playing through a work of art. staring down the Desert sun. The results may vary though, certain characters and assets have clearly received more attention to detail than others and you’ll even have the occasional texture pop-in. Not so much of a surprise, if you take into account that you can travel from one end of the world to the other without a single loading screen. But when you look at scene below and see how detailed the fabric of Bayek’s outfit is or how lifelike those wooden planks look, it’s an amazing achievement. I’m very thankful for the included photomode and I lament it at the same time. It’s clearly a worthwile inclusion as it allows you to take some decent actions shots and frame them just how you would want, but I also caught myself spending literal hours in the mode. Always on the lookout for the perfect scenery or object to capture. And don’t you dare get me started on the water physics in this game or this review will turn into an entire essay. The way the water foams, lillies float, sludge behaves under the surface… And when the sunlight hits the water just right, the HDR will make you squint your eyes as if you were staring into the real sun. Heck, there’s even an effect specifically for when you’re covered in oil and go swimming and you’ll trail some oily rainbows behind you. If this is the level of finish an extra year of development gets you, I’d like to see them outperform themselves even more in the next game. So is the engine without fault? Well, no. As I said earlier there are sometimes issues with the draw-distance ingame. But what surprised me most is the amount of issues I had during cutscenes. sometimes the screen would stutter or characters would perform the same animation twice. I can still remember when custcenes looked leaps better than the ingame graphics, but it seems we’re slowly moving to a future where that is no longer the case. While we’re discussing the audio, it’s well worth mentioning that the main voice cast did a stellar job at delivering believeable lines. 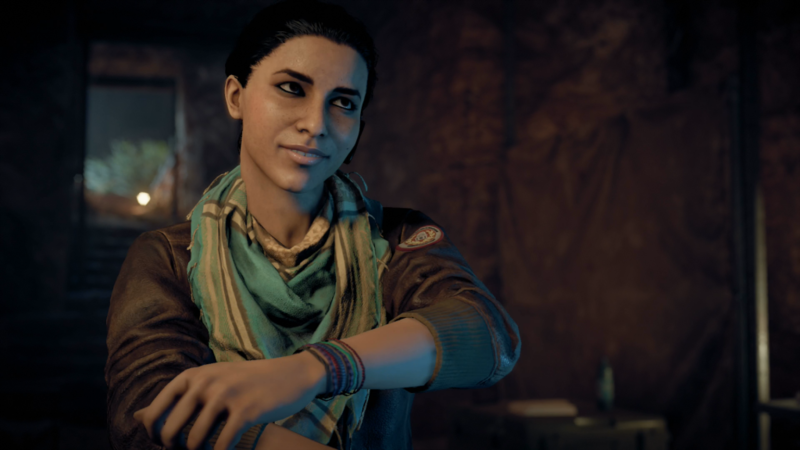 Bayek and Aya’s Chemistry is tangible and they quickly became some of my favourite characters in the series. Another noteworthy performance came from Cleoptra herself, behaving like an Egyptian version of Daenerys Targaryan. I raise my glass to you, mother of Sphinxes! 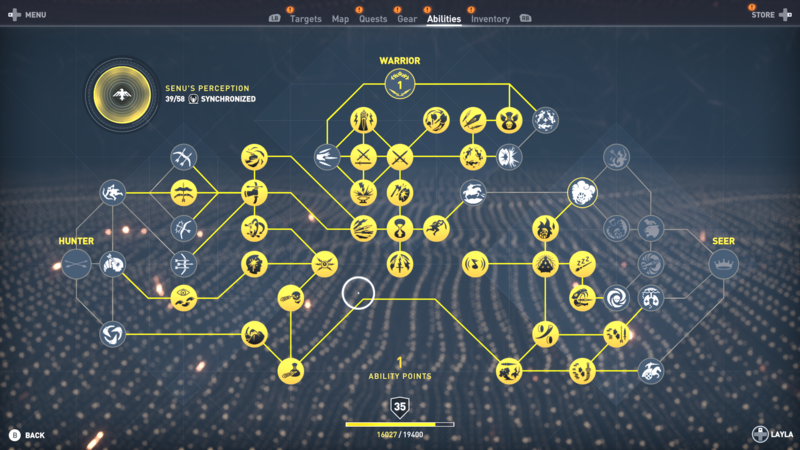 To beat just the campaign you’ll need at least 30 hours, as there are some levelling restrictions that could keep you from progressing further. While the world is vast and there are countless things to do, I feel the game is best experienced going for the main campaigns most of the time and doing some sidequests along the way if you don’t have to stray too far for them. This will guarantee that you can keep up with the story. It’s a mistake I made when playing Final Fantasy XV: first mopping up all the other content and leaving blocks of 20-30 hours in between story missions. Speaking of Final Fantasy, it’s funny how that series with a root in Turn Based combat became more of an Action game throughout its last instalments and how an action/stealth game like Assassin’s Creed became more of an RPG. They seemed to have realised this overlap themselves as both had free content of the other game in them. The RPG Elements don’t stop with the leveling system however, though this is the main element that will decide if you’re ready to face the threats in a certain region. When you level up you also get to spend ability points as you see fit. Which decides where your gameplay focus will be: long ranged bows, melee attacks or using sneaky tools. Eventually you’ll unlock everything though, but in the beginning of the game your choices here can be defining of your experience with it. Do I want to poison corpses or shoot remote controlled arrows? And I really do mean that; picking up a skill that lets you steer your arrows mid-air in slowmotion will make all the difference in how you approach an enemy camp for example. 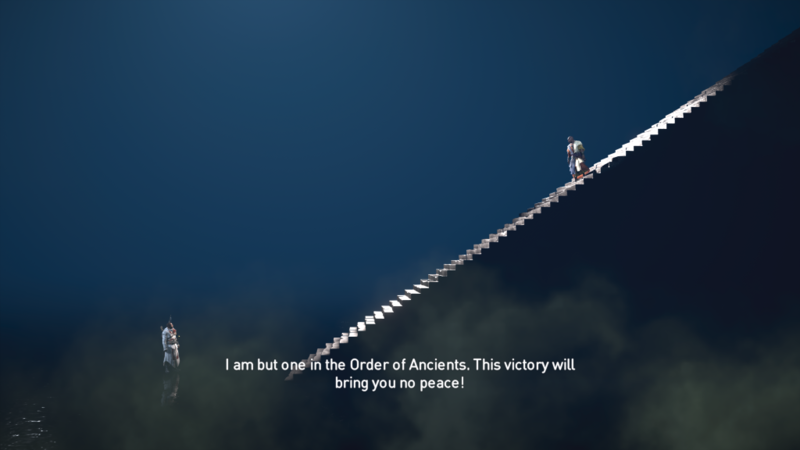 You could just eleminate most of the enemies from a high vantage point and then sweep in for the last few kills. There’s something very pleasing about shooting at some unsuspecting soldiers from around a corner. Melee combat has been totally revamped as well. No longer are you able to assasinate just any target, they have to be a lower lvl than yours or the hidden blade will not do lethal damage. Attacking no longer happens in that familiar 1-v-1 + parrying system that’s become so typical for the series (and in some extent for the Batman Arkham games). The button layout has changed as well, with the X button no longer used for attacking but instead now you do quick jabs and slashes with the RB button or heavy (charged if needed) attacks with the Right Trigger. You’ll find that you need to adapt to this playstyle sooner rather than later as you’ll be drawn into battles more easily than in previous games. Combat is also more dynamic with shielded enemies being almost impenetrable from the front, so you’ll either have to take those out in a more sneaky manner or you’ll have to evade them to get to their backside or charge a heavy weapon attack to make them lower their shield. If you charge your OverPower bar enough you’ll also do a unique move (depending on the type of weapon you have equipped) that one-shot kills almost any non-boss enemy. These look cool and because enemies are more aggresive than ever you’ll need to use it often! Equipment can also easily be changed on the fly and new ones can be found throughout the world: enemies will sometimes drop items, there are chests hidden or in plain sight scattered everywhere and you could just buy them from stores. soon all my equipment will be legen-*wait for it!*-dary! They also come in different rarities: blue items are common, purple are rare and yellow are legendary. The best way to get these rare items are by doing daily quests for Reka, a young merchant boy who will send you on vaious quests and will reward you at least a rare item. 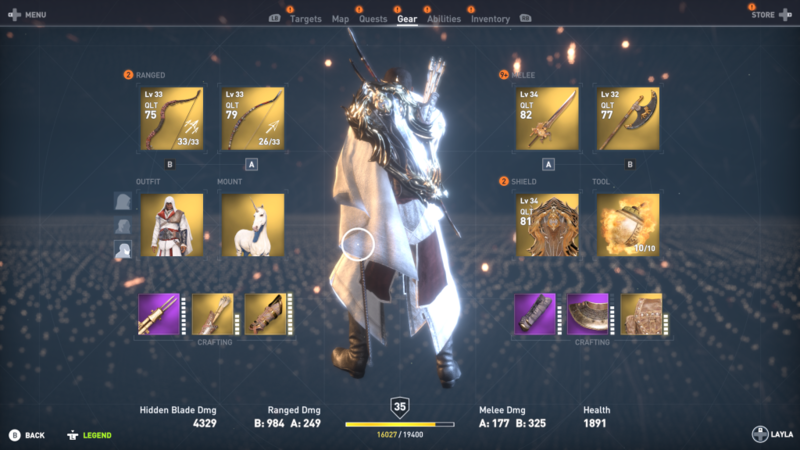 You can also level up your gear: most items are found at about the level of your character, but if you keep using it they will eventually be less powerful than any common new ones you find. Your weapons and shield can be upgraded at a weapon smith, but it’ll cost you. Other gear that will decide how many arrows & tools you can carry or how good you are with a bow or melee weapons will have to be leveled up by gathering crafting supplies like iron, wood or animal skins. This also feels like a good time to address the (war)elephant in the room: microtransactions. Ubisoft is no stranger to allowing us to purchase items from a store with real money, but I feel like the game found a great balance in it. Never did I feel the need to purchase more in-game money or buy some of the Legendary Equipment offered. It’s by no means necessary to progress the game and the pace is perfect as is. The only reason I could see people spending money there, is for the cosmetic element: perhaps there’s an outfit you really like or a mount that looks amazing. Personally, I didn’t spend a single dime in the story and never felt like they left out content that should have been in the main game and this is exactly how DLC should be handled. 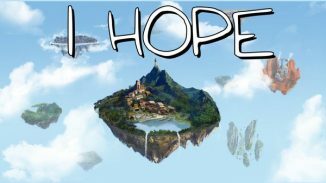 I love how a game which mainly takes place in a realistic setting still takes the liberty to add a few over the top fantasy elements. 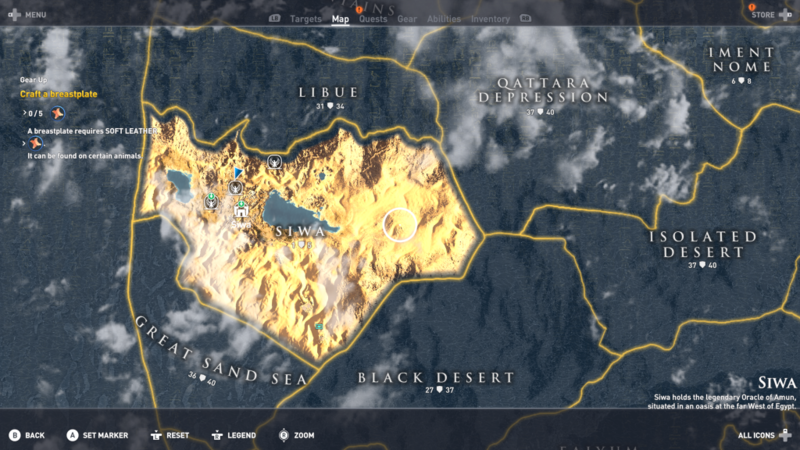 What’s really impressive in AC Origins, is the size of the world map and the density it still has compared to other open world games. You’ll never be able to walk more than a few meters without encountering something of interest. this is the opening area. you could spend hours here without even moving to the other regions. There just is so much to do and it all has a natural flow to it. You may be on the way to a main quest but encounter someone with a small task for you to perform along the way. Since this siqe-quest doesn’t make you stray to far from your previous target you decide to quickly mop it up for some gear & experience points. On the way to your sidequest you may walk through an animal den or cross a body of water with treasures hidden in a sunken boat. When you finally arrive at the marker, it turns out the person you were meant to rescue or the item you have to steal is located in an enemy encampment so while you’re there you might as well take the time to kill the camp’s commander and find the treasures there as those are required to ‘complete’ the location. How you scout out area’s has also changed. 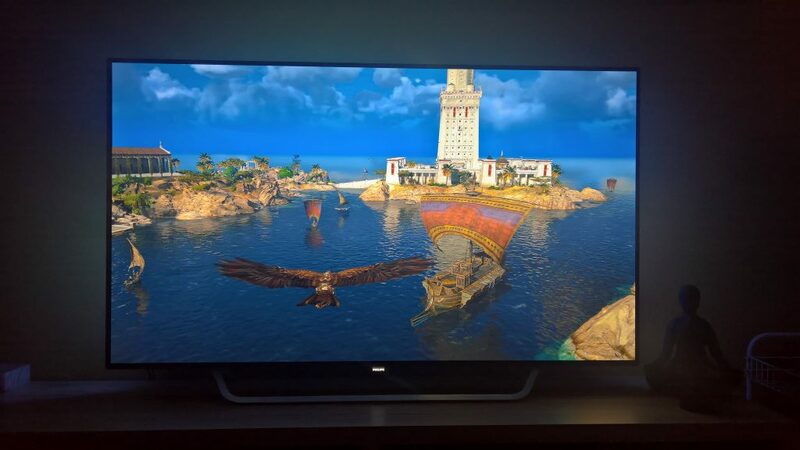 You now have a VERY LITERAL eagle vision as Senu can be sent up in the air to fly over an enemy camp. He’ll be able to highlight enemies (and even tell you what state they are in: patrolling , sleeping, peeing etc) and other points of interest like scrolls, treasure or hidden passageways. When you level up the right abilities you’ll even be able to send him to harass some enemies or he’ll drop in mid-combat and help you out when you’re fighting a tough opponent. That last one was a fun surprise by the way, for having such simple gameplay mechanics I found myself playing all of the races and really struggling to get the first place in all of them. The only regret I have is that the naval combat was locked behind story segments this time. 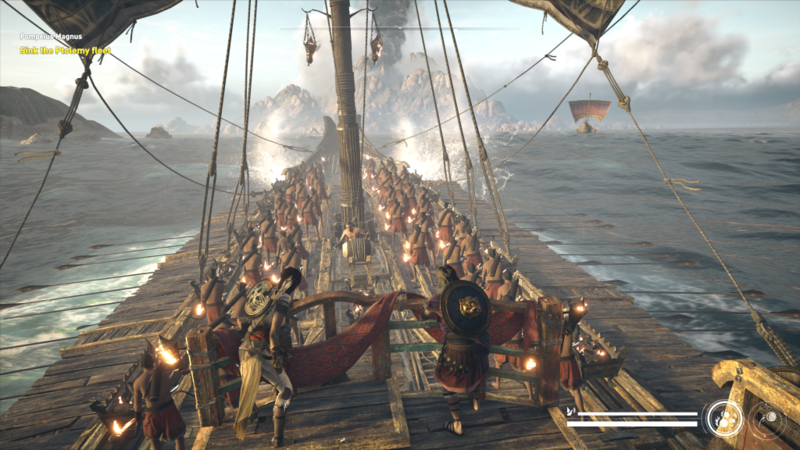 My previous favourite Assassin’s Creed, Black Flag, was praised for its interesting gameplay on the open seas. 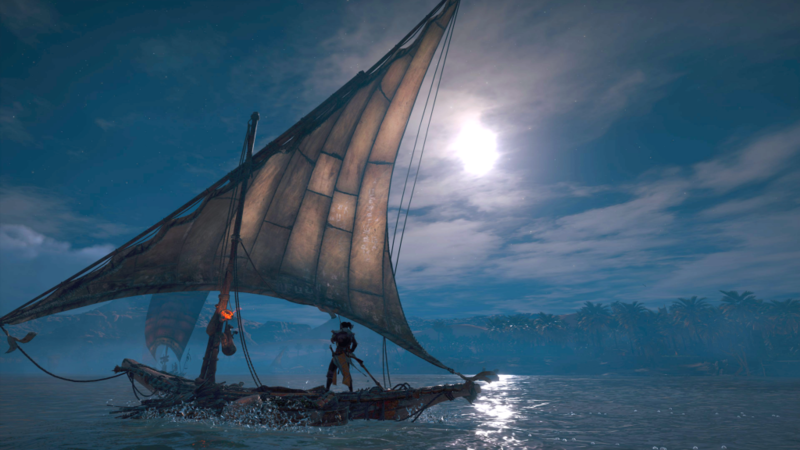 AC Origins still has this but only a few of instances and they never manage to reach the level op epicness as beating a legendary ship in Black Flag. Is pompeii having a big bonfire in the distance? Ubisoft really seems dedicated to keeping the game alive. Not only have they released a few paid DLC Episodes already, but they also have timed events where you can test your mettle against the game’s most dangerous enemies. 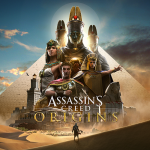 And we even got a completely free download: AC Origins Discovery Tour – Ancient Egypt. This update introduced an educational module that teaches us about Ancient Egypt’s locations, people and customs. It’s wildly interesting and a fresh change of pace from always trying to collect more loot. There are 75 guided tours and if you’re even the tiniest bit interested in history, you’ll go through them all. This is a MUST purchase, people!